This was our first recipe Amanda and I cooked together when we first had this idea to keep in touch through food and it was right around Easter last year! We decided for our first meal together, we wanted to cook the same dish so we’d have something to discuss on our skype dates. 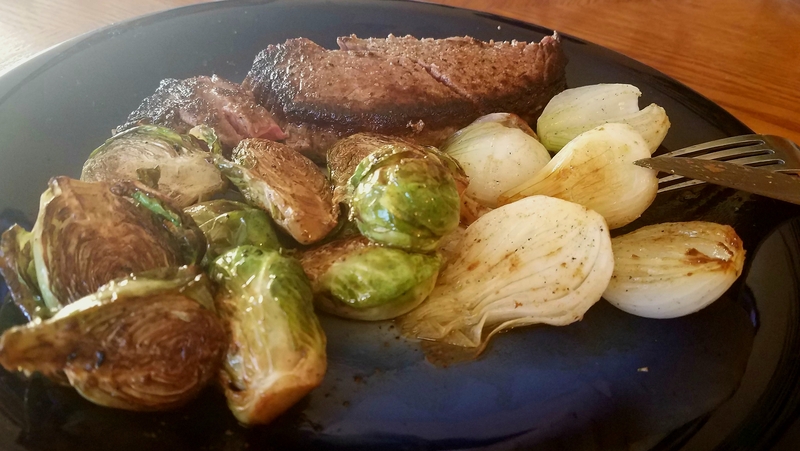 Our first meal was something of a departure from my usual dinner rotation recipes and it was a new experience in both cooking and eating for me. We decided to cook one of the traditional Easter recipes, a leg of lamb. However, upon examining the goods at the grocery store, we quickly and independently decided that a whole leg of lamb was entirely too much (much to my husband’s dismay) and decided on lamb leg shanks: much smaller and more economical. To start, we both seasoned our lamb shanks similarly, and I decided to serve my lamb with a simple cauliflower mash and roasted green beans. It was the perfect introductory meal to our new food and communication goals which have so far been successful and a blast to continue. Trim the lamb shank of any large, unwanted pieced of fat, although it is not necessary. 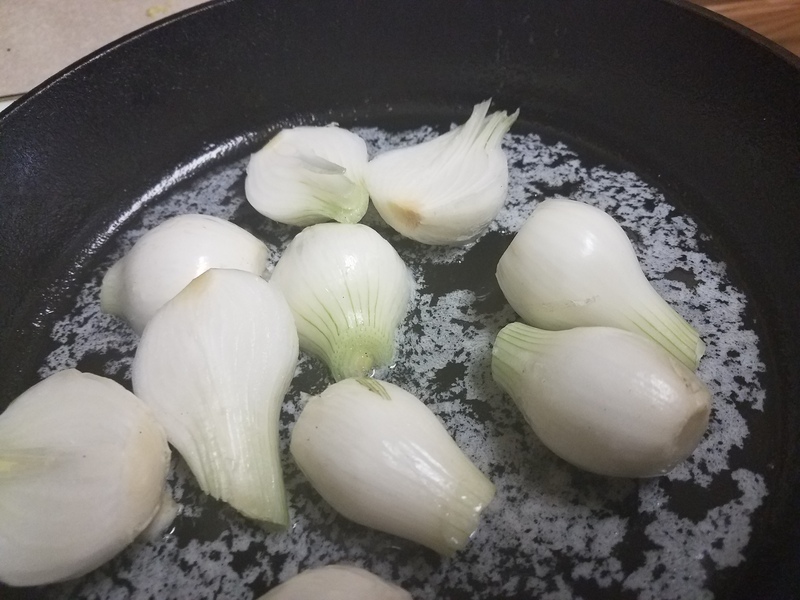 mix together the garlic, salt, pepper, thyme, and marjoram in a small bowl. Rub lamb shank with spice mixture and place in on rack in roasting pan. Add sprinkle some of the fresh rosemary over the lamb shank and add the remaining sprigs to the top for cooking. Place lamb shank on rack of roasting pan* and cook in oven for 30 minutes, or until the internal temperature reaches 160°F for Medium or 170°F for well done. I would recommend removing from the oven a few degrees lower than your desired temperature, covering with foil and allowing to rest for 10 minutes to keep everything juicy. Serve with vegetables of your choice, or the two recipes I made follow. *I did not have a specific roasting pan, so I fashioned these foil tubes to lift the shank above the floor of the pan so that it was not sitting in its own juices, and it seemed to work in a pinch. Bake at 375 for 20-25 minutes and enjoy! Wine Pairing: It makes sense that our first recipe would pair well with one of our favorite and most readily available wines. Because lamb has notes of traditional beefy flavors while also being pleasingly different, a fruit forward cabernet would be a great match with this dish. Happy cooking! So, as you can probably guess from the picture, this is from one of our Distance Dishes dates this fall. However, this recipe is a year-round favorite! I included it in my family’s cookbook compiled for our last family reunion. Adapted from a roasted pork recipe, I like this for the slow cooker – not only does it give me time for chores while it cooks (or, more realistically, a nap!). Season pork tenderloin with salt, pepper, and rosemary. 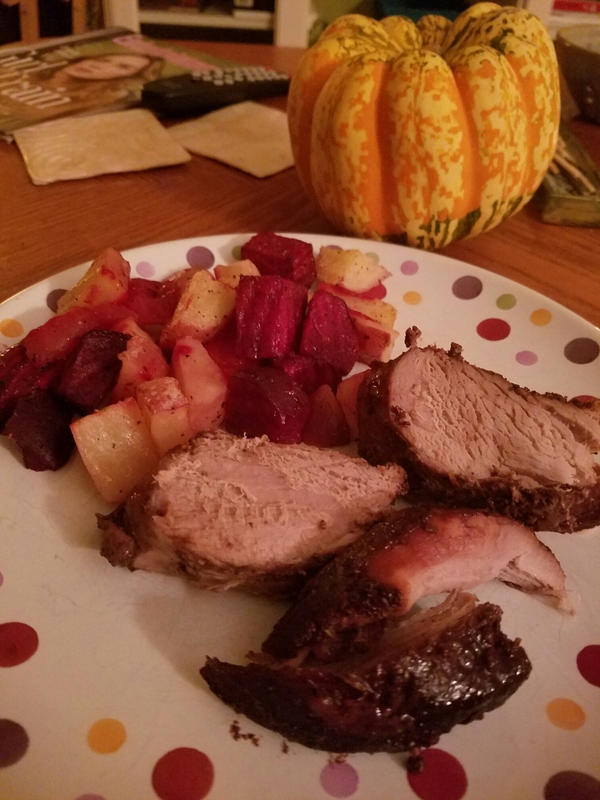 Lay pork tenderloin in slow cooker and pour over jam, honey, and wine. Wine Pairing: I had this pork with the same wine I used in the recipe, which was a Cabernet Sauvignon. The fuller flavor stands up to the slow cooking process and the pork!